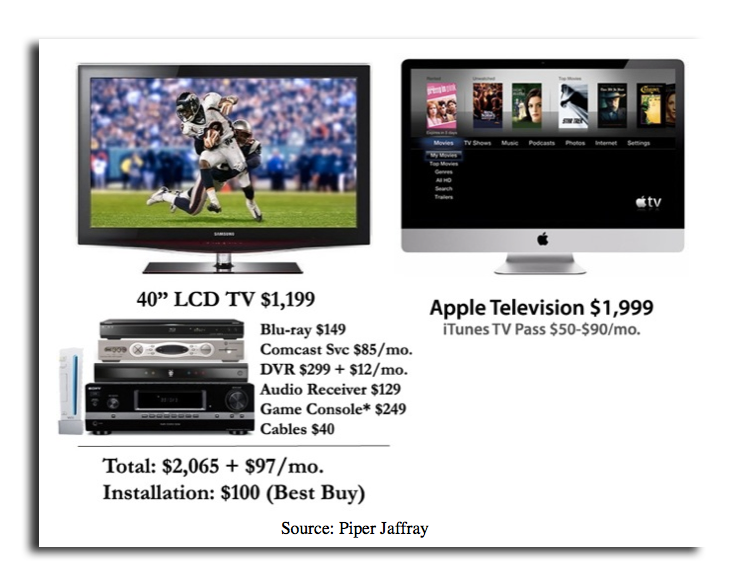 Apple's recent investment of $3.9 billion in components is likely for device displays ranging from the iPhone to the 27-inch iMac, and could signal Apple's intention to build a television set up to 50 inches in size, investment firm Piper Jaffray believes. Analyst Gene Munster issued a note to investors on Thursday in which he said recent meetings in Asia —not with component suppliers —suggested that Apple has put its secret $3.9 billion investment toward securing displays for its range of products. He said Apple is believed to be investing in manufacturing facilities and securing supply for LCD displays. The analyst also said that the investment could further signal Apple's intention to enter the television market. Munster has believed for years that Apple will introduce its own HDTV by the end of calendar year 2012 at the earliest. "While Apple's commitment to the living room remains a 'hobby,' we continue to believe the company will enter the TV market with a full focus, as an all-in-one Apple television could move the needle when connected TVs proliferate," Munster said. He estimates that 220 million flat panel TVs will be sold in 2012, and 48 percent of those —or 106 million —will be Internet-connected. He sees Apple potentially selling 1.4 million units in 2012, which would add $2.5 billion in revenue, or 2 percent, to the company's bottom line. Munster sees the TV business for Apple growing to 4 billion in revenue in calendar year 2013, and 6 billion in 2014. He said Apple's component investment, believed to be in displays, could allow Apple to procure screen sizes up to 50 inches. The analyst also noted that Apple has highlighted display technology in the marketing of its products, including the iPhone 4 Retina Display, and the 27-inch iMac LED backlit display. Advanced display technology, Munster said, has become an important part of Apple's business strategy. Last month, during his company's quarterly earnings report, Apple Chief Operating Officer Tim Cook hinted at his company's long-term component supply contracts, and revealed that the company had invested $3.9 billion. Cook said he felt the secret deals were a "fantastic" use of his company's massive cash reserves, but declined to reveal what the investment might be, because the strategic move is "competitive" in nature. Cook compared the investment to 2005, when Apple made a major investment by prepaying for flash memory. That long-term deal helped Apple secure enough NAND flash to place it in nearly all of Apple's devices, including the iPhone, iPad and new MacBook Air.